Using Honey with RSS feeds. How to use our RSS integration to automatically pull content from outsides sources into Honey. Our RSS integration allows you to pull content from your favorite sources — news outlets, online publications, internal tools, blogs, and more — into Honey in real time via the sources' RSS feeds. Once set up, new content from the article source will post in Honey just like the posts your team members share. We'll walk you through the steps to get all set up. Beneath Add an Inbound Integration, click the orange RSS icon. This will unfurl all the RSS setup fields. Paste the RSS URL from your content source in the Feed URL field. 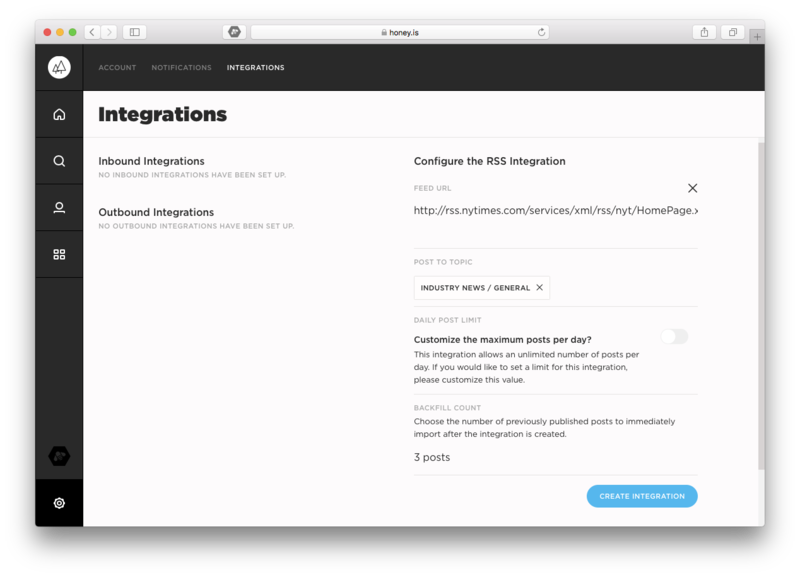 Manage all RSS integrations in your organization.